‘I’m someone who’s interested in policy and operations of state government|! !| someone who analyzes policies of state government and wants to make them better|! !|’ says Charlie Arlinghaus|! !| newly appointed as commissioner of the NH Department of Administrative Services. Charlie Arlinghaus, New Hampshire’s new commissioner of administrative services, has been in the Granite State long enough to become something of a New Hampshire institution. 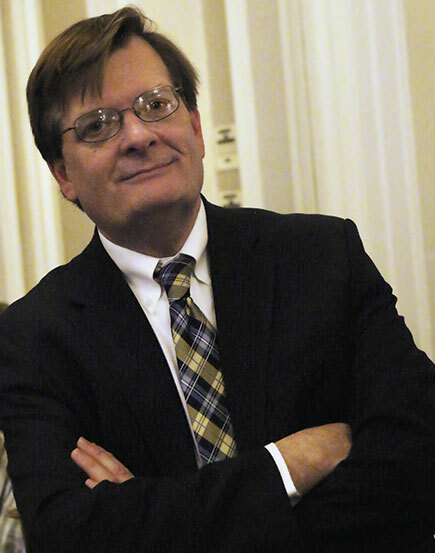 For 15 years, he was president of the Concord-based Josiah Bartlett Institute for Public Policy, a “free-market think tank,” and Arlinghaus has served both as regional political director for the Republican National Committee and executive director of the Republican State Committee in New Hampshire. He has been a political consultant to Republican candidates for governor and for U.S. House and Senate. The interview below took place at the State House shortly before the end of this year’s legislative session. Q. Do you see your focus on the state budget as president of the Josiah Bartlett Center having been useful experience for your work now at the State House? A. Yes. I would say for more than a decade part of my job has been as a budget analyst. Q. How does it feel to be looking at the budget from the inside rather than as an outsider? A. It feels not that different. One great thing about New Hampshire is that our process is very transparent and everyone has access to most of the documents. So if you’re boring enough to be interested, there are no surprises. Q. Is it frustrating at times that you’re no longer in a position to criticize aspects of the budget as you often have in the past? A. No, not at all. Actually I’ve always understood that the final document involves tradeoffs and the collective input of people who don’t agree with each other. Any budget that has 10,700 line items in it will never be one in which you love every line item. Q. Would you care to mention some line items you don’t love? Q. Do you find that your outlook and the governor’s are pretty similar? A. I think so. I think a great strength of the governor is that he likes to surround himself with people who have opinions and he listens to them. Q. Do you believe you are having sufficient input? A. Oh, I am. More important, I’m really happy with the attention to detail the governor shows. He’s been very good at keeping his eye on the big picture. One difficulty that comes up is, you can’t require agencies to do things and then not give them the staff to do them with. You have to balance the cost with the benefit of the action. Q. How does a government with 10,700 line items in its budget maintain its reputation for frugality? A. I think New Hampshire is more frugal than most states, but that never means that you ever stop looking for areas to improve in. I don’t think anyone should ever be satisfied with any program. Complacency is the enemy of any activity. Q. Critics have often characterized New Hampshire frugality as a stinginess and lack of adequate funding for services that people need. How do you respond to that? A. I don’t know. I think we do a lot for a lot of people, and we do a lot of it well. Our system for people with disabilities is recognized as perhaps the best in the country. Q. You mentioned that being occupied with budget details might seem boring to many, perhaps most people. What keeps you interested? A. I’m fascinated with how things work and operate, and so many aspects of any large institute are complex, but have historic roots. You can’t understand why we do things the way we do if you don’t know how they’ve been done over the last 40 to 50 years. Q. Could you offer and example? A. We have an organization called DRED [Department of Resources and Economic Development] It’s an interesting amalgamation of functions which exist because [former Governor] Wes Powell thought it was a good idea in 1961, and the governor is now reorganizing it so economic development stands on its own while marrying natural resources with cultural resources in a broader department – the Department of Natural and Cultural Resources. The idea is to take the economic development function and partner it with other economic-focus agencies of the state. Q. How are revenues shaping up to match with the budget projections? A. Revenues are going up a fair amount. We had to fight with the Legislature. We were actually more optimistic about revenue projections than the Legislature is. The budget has their estimate in it. But they will be proven wrong. Q. The late NH Sen. Clesson Blaisdell of Keene, who was an advocate of a state income tax would talk about the unpredictable nature of state revenues under the existing tax structure. How do we know, he asked, that next winter we’re going to have a lot of snow and we’ll have a lot of skiers coming up from Boston and elsewhere and spending money here? How do we know next summer is going to be extra hot and people will buy more beer? A. The truth is we don’t know anything. But if you estimate conditions with an eye toward history and trends, you can come pretty close. And because we have a broad basket of taxes, we can be a little off on some and make it up on others. Q. What are your responsibilities in your new job at the Department of Administrative Services? A. DAS covers most of the operations of state government and personnel – public works, financial management and the budget. Q. You’ve become rather well known and identified with budget issues in New Hampshire, through your interviews on radio talk shows and your weekly columns in the NH Union Leader. You’re also well known as a policy wonk and number cruncher. So the question is not who, but just what is Charlie Arlinghaus? Are you an economist, an accountant or what? A. I’m someone who’s interested in policy and operations of state government, someone who analyzes policies of state government and wants to make them better. I like being a policy wonk and I like to crunch numbers. Q. You also have quite a history of involvement in Republican politics. How important is your party affiliation to you? A. It isn’t. I was never wedded to a party as much as to ideas and solutions. Q. As far as I know, the Josiah Bartlett Center is the only “free-market think tank” in the state. Does that suggest New Hampshire is not as conservative as its long-standing reputation suggests? A. I don’t think New Hampshire has ever been as conservative as people think. It’s always been fiscally cautious but beyond that, it’s somewhere in the center. Q. A dedication to free markets suggests devotion to limited government and a large role for the private sector on economic and social issues. Are there any agencies of state government you would like to see eliminated? A. I think my job is about servicing the other departments of state government and working with them to make them all work better.